What do Timothy, a neutron star, a dancing bear, Naomi, Bobbie, Duarte, and Dr. Elvi Okoye have in common? As improbable as it may seem, all of them play a major part in Tiamat’s Wrath. For those who have read the Expanse novels but not the novellas, I would strongly suggest that you read all of the novellas before reading Tiamat’s Wrath. The revelations in the novel are so much sweeter for those who understand the plot nuances and hints that come from reading the novellas. 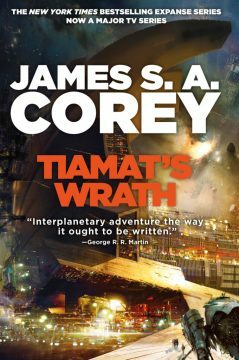 Tiamat’s Wrath is the eighth and penultimate book in The Expanse series of novels by James S.A. Corey (Ty Franck and Daniel Abraham). It is the grandest of space operas, where humanity journeys deep into interstellar space where they discover something that should be impossible with humanity’s knowledge of physics. Even with this massive scope, readers always see what is happening through the eyes of the human narrators, which makes these events much more accessible. There are truly heroic moments when the best of humanity gives us hope. However, these moments are juxtaposed against those times when actions based on our hubris threaten the destruction of humanity. Tiamat’s Wrath has all of this, and more. This epic tale tells the story of humanity being humanity, and the cost humanity pays for its heroics and stupidity. Tiamat’s Wrath picks up the saga several years after the events of Persepolis Rising as it sets the stage for the final novel of the series. Have a handkerchief handy because this novel is an emotional flip and burn! Tiamat’s Wrath continues the use of historical names in the title, Tiamat is an ancient Babylonian goddess, as well as the name of a five-headed draconic goddess in Dungeons and Dragons. Tiamat’s Wrath also continues the use of point-of-view chapters. Naomi, Elvi, Holden, Alex, Bobbie, the dancing bear, and Teresa all provide their unique perspectives to the readers as they witness humanity dealing with its own internal squabbles, while the threat of the aliens (who destroyed the Builders) looms in the background. On Laconia, Holden is paraded around like a “dancing bear on a leash.” Although he is under house arrest, Holden is not helpless. He does not have any allies, but Holden knows in any dictatorship there will always be palace intrigue. Holden is playing the long game but sometimes there are innocent victims who are caught in these political games. Duarte’s daughter, Teresa, is one of those victims. Teresa is an adolescent who is going through those usual things a teenager goes through. She has a mysterious friend named Timothy whom she secretly meets. She can confide in Timothy because, unlike everyone else in her life, he does not judge her. He is always honest and straightforward with her. While Duarte involves Teresa in Laconian affairs, he is not totally honest with her. Although Duarte loves his daughter, he has far more pressing matters that demand his attention. He has sent a scientific expedition, led by Major Elvi Okoye, to study the Ring network “dead systems.” Among the “dead systems” they find extraordinary examples of destruction and construction beyond the known science of humanity. These incredible findings are of immeasurable scientific value, but again, trust that Duarte has plans within plans. The Resistance has not been idle while Duarte has been trying to understand the alien entities. Naomi, working from a hidden, solitary location, has been helping to lead the Resistance. Bobbie commands and Alex pilots the captured Laconian warship, Gathering Storm. With Bobbie in command, readers should expect a lot of action. Throughout the novel, the reader always feels that the decisions and consequences are organic to the story and unfortunately, all too human. Even Duarte, who is no longer totally human, makes decisions which seem to be reasonable to him but are ill-advised. In some ways, Duarte cannot be blamed for all of his decisions. Readers have always known that Paolo Cortazar has his own agenda. Did Duarte ask enough questions about the Protomolecule? Godhood is an enticing hook. Duarte’s hubris quashed any doubts that he otherwise should have had. Also, the exigencies of war do not allow for a lot of time for self-reflection. Clearly, Duarte’s belief that humanity is at war with the alien destroyers colors his decisions regarding them. However, his pride blinds him with respect to his ability to confront them. While this is a review with some spoilers, I hope to publish a comprehensive review in a few weeks; this will allow fans the opportunity to read and digest this incredible novel. I believe that Tiamat’s Wrath is the best novel in the series at this point, just as in the television series, where each season is the best until fans see the next one. Tiamat’s Wrath’s scope is phenomenal and it is an emotional roller coaster! It’s a must-read for Expanse fans around the world. Michael Pea is a guest writer for The Expanse Lives. Follow him on Twitter @miclpea and read more of his work at Friends of Comic Con.